Most people are familiar with home saunas because relaxing in a hot place is a great way to relieve stress and aching muscles. But saunas can be expensive and difficult to install. One great alternative to a traditional sauna is a 3 person infrared sauna. Infrared saunas are quickly becoming a popular choice in home spa treatments because they are easy to install and use. They also come in a variety of styles with different shapes, colors, and capacities available. However, a quality 3 person infrared sauna can be hard to find. There are a lot of cheap designs, which will leave you disappointed. Our guide is designed to help you find the best 3 person infrared sauna that you and your company will be comfortable using week after week. Below we have some important features to consider, as well as a list of the seven best 3 person infrared saunas. If you like the wood Hemlock, look no further. Radiant Saunas offers a beautiful Hemlock design that is scratch-resistant. This gorgeous design will have you relax in style. A tempered glass door reveals a beautiful interior and comfortable seating. With this 3 Person Sauna, everybody can experience the ultimate escape. This design uses 7 carbon heaters to create a comfortable environment. It also has an integrated chromotherapy system, which holds the infrared lights. To set the mood, there is a built-in stereo sound system with a CD player, radio, and AUX connection. There is a smart LED control and a towel rack for easy storage. With this 3 person sauna, you’ll have heaven in a box. 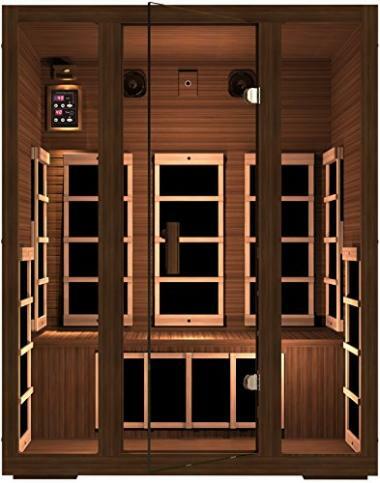 For the best performance, JNH Lifestyles offers a double layer Canadian Hemlock infrared sauna. This sauna is heated with 8 carbon fiber far infrared heaters, which will keep the perfect temperature. They use digital control to set the temperature and the duration of time that you wish to use your sauna. The best insulation will also keep all the heat inside, so you can relax for longer times. For additional relaxation, there is a built-in AUX control and 2 premium speakers. Empava’s infrared sauna design is quick heating, beautiful, and hot. This sauna can reach temperatures of 141 degrees Fahrenheit and will reach that temperature in only 15-25 minutes. It uses a safe 110 volts to power the sauna, as well as the electronic oxygen ionizer, reading lights, and stereo sound system. With Bluetooth speakers, you’ll be able to sit back and relax to your favorite music or start a party with your friends. An LED touch interior control panel ensures you always have the perfect adjustments to be stress free. JNH Lifestyles makes the list again because of their beautiful designs. 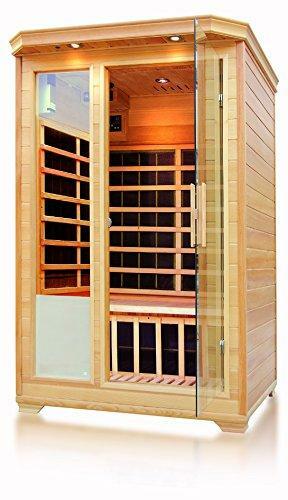 This 3 Person Far Infrared Sauna uses 8 carbon fiber heaters to deliver the best performance. It has a digital control for the temperature and timer of the sauna. For your enjoyment, there is a built-in AUX control and 2 premium speakers to listen to your music or ambient sound. The beautiful finish is made of Canadian Cedar and is double layered for durability. Heatwave delivers on their name and brings the relaxing power of steam heat to your home. The Santa Fe Infrared Sauna uses 7 carbon heaters to achieve the perfect temperature for relaxation. For convenience, there are dual interior and exterior LED control panels, which will give you the perfect mood lighting too. There is a CD player and MP3 plug-in for your enjoyment. You can also keep your towels handy with the provided hooks. To top off our list, DYNAMIC SAUNAS delivers their Maxxus Infrared Saunas for your home spa enjoyment. It uses 7 Maxxus low Carbon heating panels to deliver the perfect temperature. The panels are evenly spread out throughout the siding, so you will get an even heat. It has a full 3 person capacity and can operate beyond 140 degrees Fahrenheit. A natural reforested Canadian Hemlock gives it a durable but beautiful design. The bronze tinted tempered glass door finishes the stylish look. Out of all the saunas, infrared saunas are becoming a popular choice. They have amazing benefits and can even help you fight cancer. A 3 person sauna is a popular choice because they are the perfect capacity for a larger sized household. Not everyone may want to use the sauna together, but 3 is the perfect number to relax with company. Yet there are many different models available and you are faced with a difficult choice. Here are some features that will help you determine what makes a quality three person sauna. These tips will may the buying process faster and easier, so you can get back to blissful relaxation faster. The first big choice you will have to make when purchasing a 3 person infrared sauna is where you want to put it: inside or outside? Not all sauna designs can be used both indoors and outdoors. Most three person saunas will be built to be used as either an indoor or outdoor sauna. The choice will be up to your personal preference to choose where you want to install your 3 person sauna in your home. There are three typical ways a 2 person infrared sauna is heated: electric, ceramic, or carbon. Electric is the most common and traditional way to heat a sauna. This will use a pile of rocks that are heated up in about 30 minutes. Once the rocks are heated, water is sprinkled over the top to generate the steam. Ceramic infrared saunas can be heated quickly; in about 10 minutes. The heat is long-lasting and it is inexpensive to operate. But they are more expensive initially, because the ceramic heaters are powerful and fast. Whereas, carbon fiber heaters will use panels that heat the sauna quickly and they are less expensive than electric saunas. Saunas do require electricity to work. 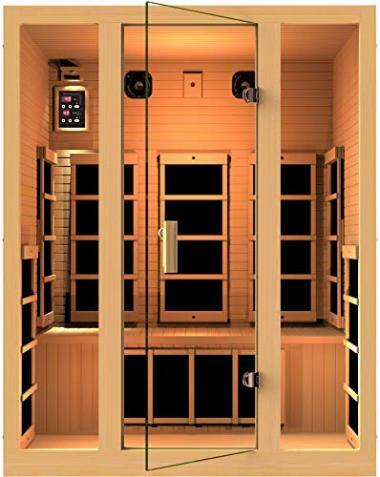 The majority of top rated infrared saunas for 3 people will use 110 or 1120 volts. This is the standard voltage that is found in a home and will not require any professional wiring or installation. Most saunas are made out of wood because it is a durable and long-lasting material. Wood is also very attractive and is a stylish addition to your home. However, there are a lot of different types of wood. The most commonly used for three person saunas are Cedar, Hemlock, and Aspen. Some three person saunas will come with additional features that can elevate your spa experience. LED lighting is a great design choice because it provides great visibility while you are inside using the sauna. A music connection, like an AUX output is great for listening to your favorite music or calming sounds to ease your mind. Vents are also great because while you want the heat, you don’t want too much or any odd smells to build up. A vent is a way to still allow fresh air inside to make you more comfortable. Finally, a smart control panel can make using your 3 person infrared sauna frustration-free. With the control panel you can choose settings like temperature, time, and lighting. If you are looking for even more features, look at the 3 person infrared sauna reviews. Other buyers will often write reviews about how well the sauna worked, including all its features, which can save you a lot of time and frustration. A top rated infrared sauna for 3 people is an investment, but you should still be able to set a reasonable budget for your purchase. It’s important that you look for quality designs within your budget, so that you can find the best 3 person infrared sauna. If you are willing to do without a few extra features, you may be able to lower your budget to make the 3 person sauna more affordable. Temperature is important for a sauna because you don’t want to set it dangerously high. If you like your sauna hotter, that’s okay. But you should be aware if you are having difficulty breathing or feel claustrophobic, so that you can turn down the heat. You should also invest in sauna thermometers, which will tell you the exact temperature inside your 3 person sauna. Q: What are the benefits of an infrared sauna? A: There are numerous benefits of infrared saunas both for the home and the user. Infrared saunas are easier to install, use, and maintain than a traditional sauna. They can be a great choice for someone who wants to use a sauna, but don’t want all the complications of a professional installation. Infrared saunas can be simply plugged in and turned on. For your health, saunas have amazing health benefits. You can detox, ease muscles, clear your head, help you skin, promote weight loss, and even assist your body in fighting cancer. There are endless ways in which your body can benefit from the use of an infrared sauna. Q: What is the best place to place a sauna? A: This will depend on your home. There are both indoor and outdoor sauna designs, which means its really up to your personal preference and the space around your home. 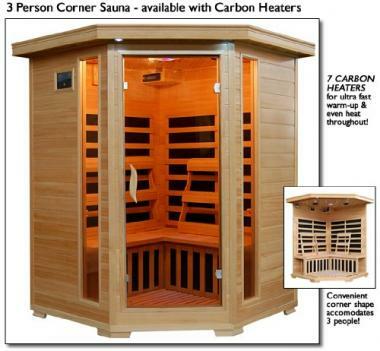 There are even 3 person corner infrared sauna models, so that you can save more space. Ultimately, you just want to ensure that there is adequate space for you sauna, whether it is inside your home or outside. A top rated infrared sauna for 3 people is an excellent addition to any home for a 5-star spa experience. An infrared sauna offers affordability, easy use, and durability to deliver a relaxing place for you to unwind in the privacy of your home. With the best infrared sauna for 3 people, you will be able to share the joy of a sauna with your family and friends. 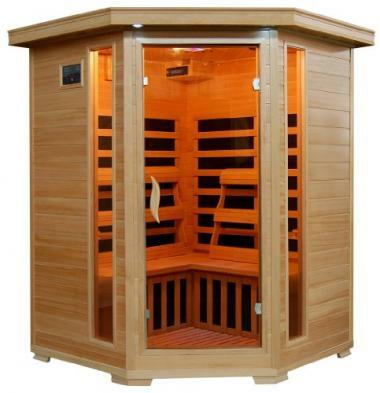 Do you own one of the 3 person infrared saunas that made it onto our list? Let us know how it has worked for your home spa treatments in the comments section below.